If Trash Could Talk is part of OLogy, where kids can collect virtual trading cards and create projects with them. 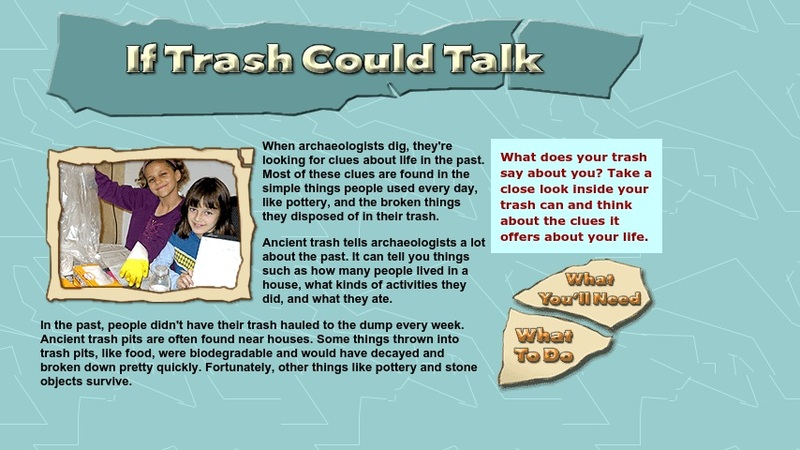 Here, they learn why ancient trash pits can be buried treasure chests for archaeologists.The activity begins by explaining how ancient trash can provide clues about how people lived. Then, kids are given step-by-step directions about how to go through a trash can from their house, chronicling and categorizing what they find. The activity includes a Trash Checklist, a printable PDF worksheet with a dozen questions to guide their investigation, and an interpretation of the trash they are viewing.